Place it under the plant tray, pots, aquarium tank or surrounding it on the carboy and keep the warmer environment to increase plant germination success, fish more vitality and tasted beer what you need. Product is designed to warm the place by 10℉ to 20℉above the room temperature. DO NOT ALLOW TO SIT IN STANDING WATER. DO NOT PLACE HEAT MAT INSIDE GROW MEDIUM. DO NOT PLACE ON OBJECTS WHICH MAY PUNCTURE THE HEAT MAT. Heat Mat is designed to warm the root area by 10℉-20℉ above grow roomtemperature. ITC-308: Dual relay allowing you to easily connect with refrigeration and heating equipment to realize ideal temperature control. 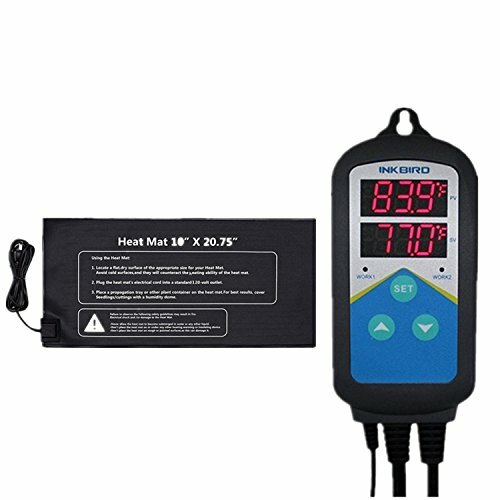 ITC-306T: Heating output temperature controller(No Cooling Control) with time function specifically for breeding and planting. ITC-310T: Dual relay, programmable outlet thermostat, which can auto-execute to control 6 periods times with different temperatures based on its timer function. Controllers setup is easy, straightforward and quick，Simple and Versatile Heat Mat. DLS Seedling Heat Mat Warm Hydroponic Heating Pad 10" x 20.75"
Newcomdigi waterproof Seedling Heat Mat, Warm Hydroponic Heating Pad for Seedling, Cloning, & Germination, 10" x 20.75"
Sunleaves Super Starter Heat Mat, 20" x 20.75"